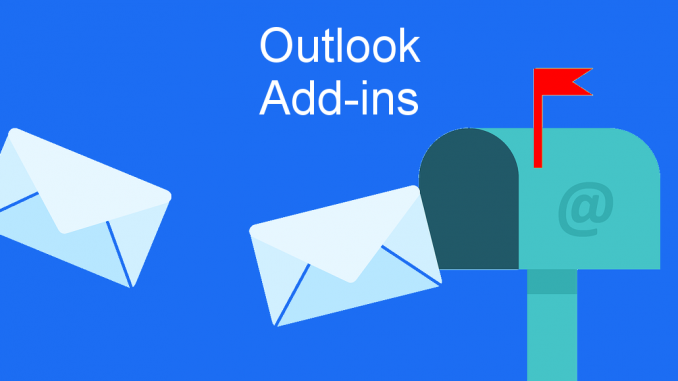 Add-ins for Outlook.com email add features that work on the website and also on your phone in the Outlook app. See how to enable add-ins and power-up email with Trello and other tools. Outlook.com is Microsoft’s hugely popular email service and it can be accessed everywhere – on desktop computers using a browser and on Android and iOS phones and tablets using the Outlook mail app. It is used by millions of people and Microsoft has been steadily adding new features over the past year or so, turning it into a powerful email service. It is pretty good and has many useful features but it can be made even better by integrating it with external services like project managers, task managers, organisers, calendars and to-do lists. Quite often we receive an email that requires some sort of action and there is a task that needs to be done, either by us or by someone else. The email might contain information useful to a work or personal project and we don’t want it to be lost among the thousands of other emails in our inbox. We often fire up some external app or website and add the contents of the email to a project or task, copy information from it and save it elsewhere, make a note to reply or forward the message and so on. An email can result in us doing or scheduling tasks. By using Outlook.com add-ins you can perform these tasks without leaving your inbox. Add-ins integrate with external services like Evernote, MeisterTask, Nimble, SmartSheet, Trello, Wrike and others, and they enable you to create tasks and store information from emails from within a message in your inbox. Add-ins save time and effort, particularly when using a mobile phone where switching between apps and copying information from one to another is harder than on a desktop computer. Let’s see how to install an add-in in the Outlook email app on an Android phone. I had to use a desktop computer at one point and couldn’t quite get it all set up on the phone, but now it is working fine. Open the Outlook mail app on your phone and press the hamburger in the top left corner to open the menu. Press the gear icon in the bottom left corner to enter Settings. Scroll down the page and press Add-ins. A list of add-ins is displayed and you can see some of them in the screenshot. More will be added, so if you don’t see what you need today, try again next week or next month because it may have been added. I selected Trello, which is a popular task and to-do manager and I am using a free account. I use a free Outlook.com email account with no Office subscription. 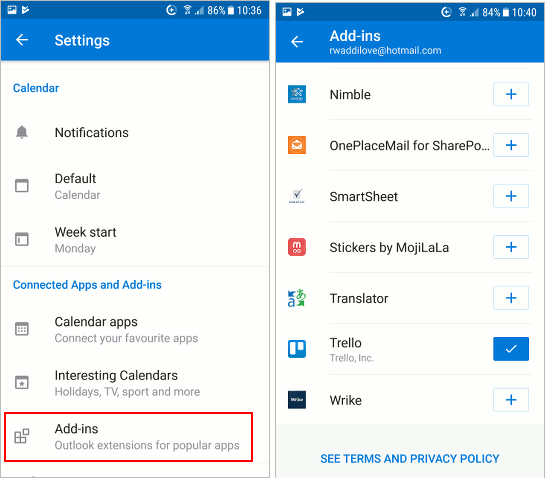 When an add-in is installed in the Outlook app on the phone (or anywhere else) you are prompted to log into your account and authorise access. This is where I ran into a problem with Trello. If you log in with a username and password you will be fine, but I log in with a Google account. However, for security reasons Google refuses to log you in from within an app – Google logins can only be from a browser. I could not log in to Trello and authorise the add-in from within the Outlook app on my phone. After a bit of head scratching and experiments I ended up at the Microsoft AppSource website in a browser on a computer (a Mac or PC is fine). Search for Trello and click the GET IT NOW button. 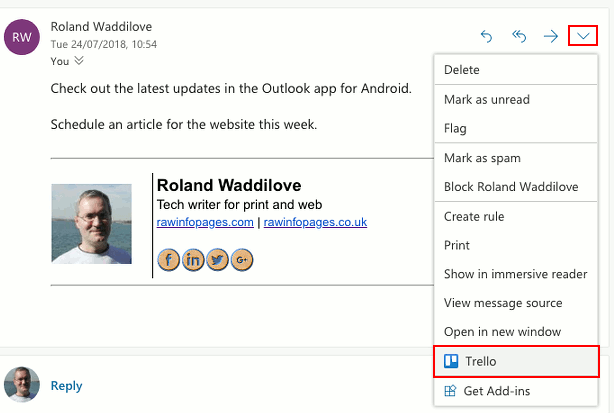 Now that Trello has been added to Outlook.com open an email in a browser on the computer and click the down arrow at the top right. This displays a menu and down at the bottom is Trello. Click Trello and it prompts you to log in to the service and authorise the app. The Google login works OK in a browser on the computer. 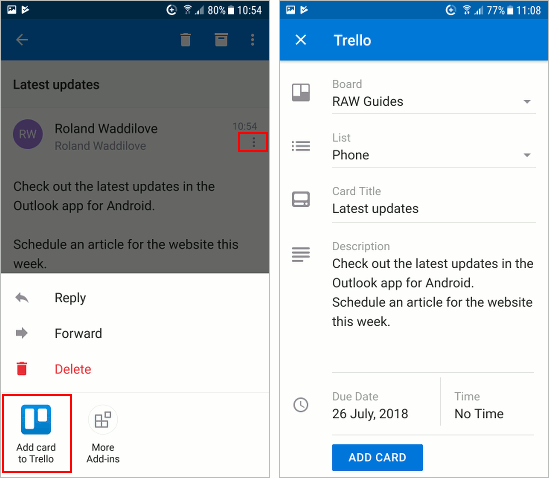 Now that the Trello add-in is authorised and logged in to the service, it can be used on the phone in the Outlook app. Open an email and press the three dots in the top right corner. A menu slides up from the bottom of the screen and your add-ins are displayed. Press Add card to Trello and The contents of the email is used to create a card. The board and the list within the board can be selected at the top. The card title is taken from the email subject and the card description contains the body of the email. A due date and time can be set at the bottom and so you can schedule tasks to be done. This makes creating cards so much easier than going back and forth between Outlook and Trello apps on the phone. 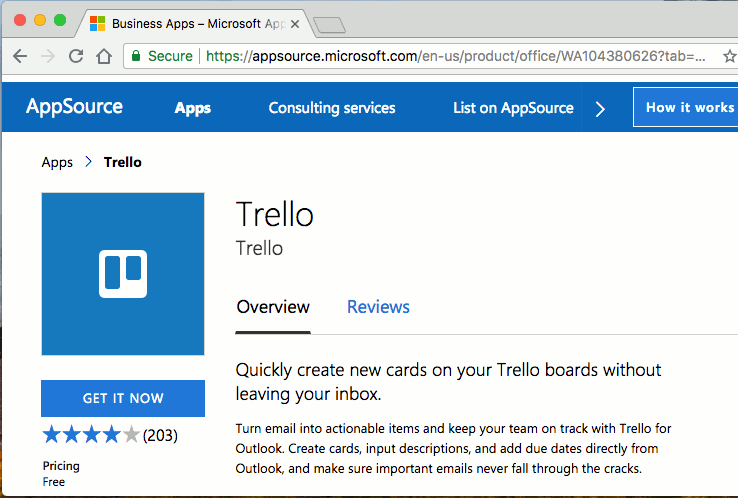 If you are not a Trello user, check out the other Outlook add-ins because you are sure to use at least one of them. If you have login problems with the add-in on your phone, use a desktop computer to install the add-in and then it will work with your phone. Hopefully the Outlook app will sort out this glitch.